This article cover my first day on the Lechtaler Höhenweg: almost 3 day stages in one day leading to the Ansbacher Hütte. Last summer I looked for a strenuous 7 to 8 days’ hike within easy reach by public transportation from Munich and found the Lechtal Höhenweg. 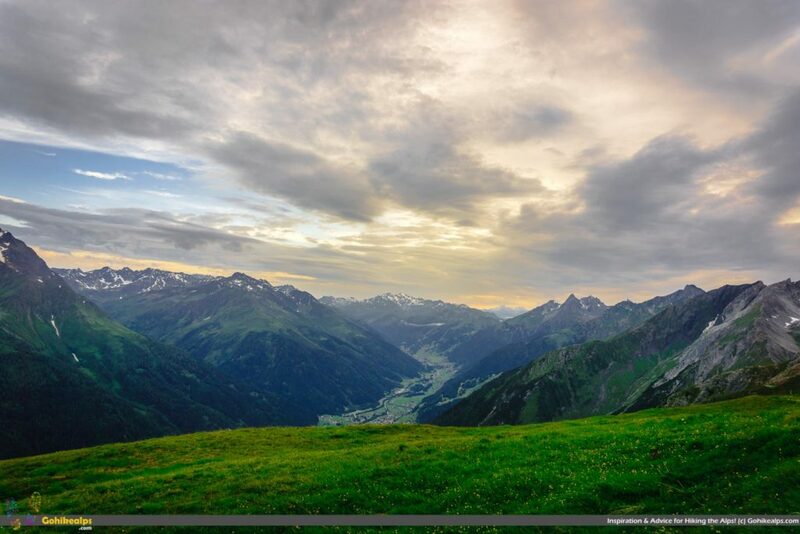 The Lechtaler Höhenweg is a 10 day hike that goes across the main ridge of the Lechtaler Alps and ends at Anhalter Hütte about 100 kilometers later. 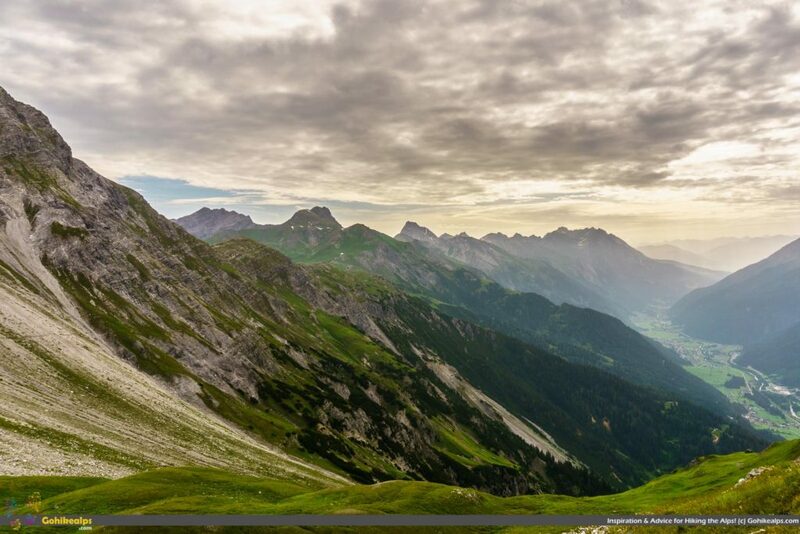 It starts at Stuttgarter Hütte, near Lech, but you can get on and off the trail in several places. You can do it in less days than 10 if you squeeze in some longer days. 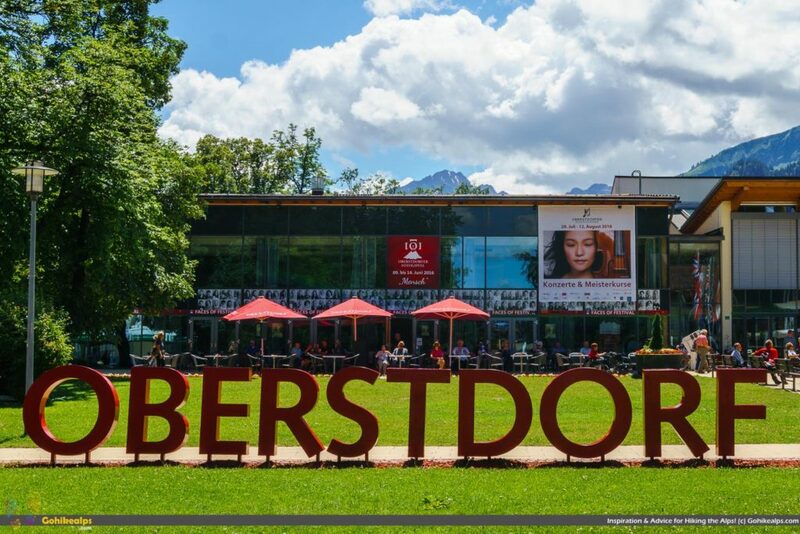 A logical place to end is Imst, which offers plenty of transport options back to where ever you came from. 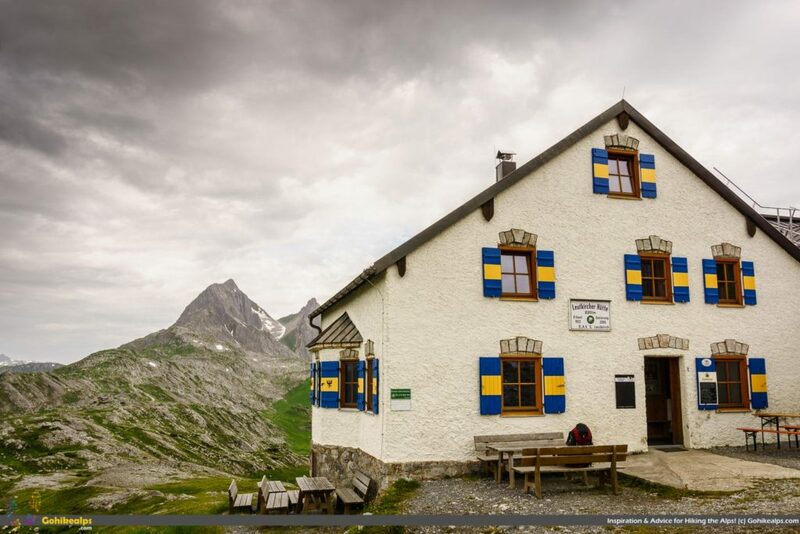 See the Gohikealps post “The Lechtaler Höhenweg Planning Guide” for all the details you need to plan for this trip – including contact info to all the 13 mountain huts along the way as well as listings of the different route variants you can take. 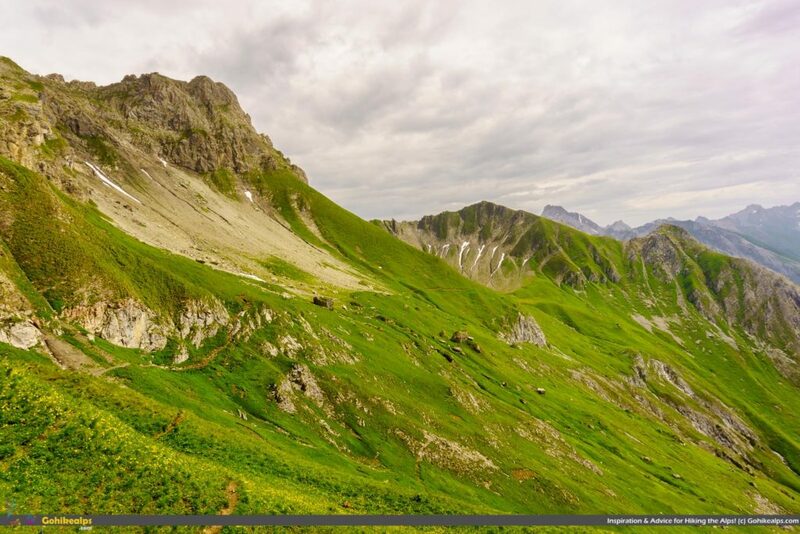 Originally I was going to be hiking alone and my plan was to do the entire Lechtaler Höhenweg end to end – including doing the very long and difficult Augsburger Höhenweg variant. A few days before my flight, a good friend of mine suggested that he’d like to go, too, but would only be able to go for a few days and would prefer something a little easier. So, plans were adjusted last minute and we decided to walk together from Oberstdorf in Germany to St. Anton in Austria. Both places can be reached by train, which was essential for my friend’s travel plans. Oberstdorf to St. Anton was a nice walk in very nice weather – there’s a brief description of the walk here. Once in St. Anton we parted ways with my friend and I was then going to hit the Lechtaler Höhenweg. I’ll eventually write an article on Oberstdorf separately, but I’ll just say here that it’s a good place for many interesting things. It’s only about 3 hours by train from Munich Airport. Walking to St.Anton is a nice option but if you have more time, the E5 that goes all the way to Merano in Italy would be something to consider! My adjusted plan was to walk from St. Anton to Muttekopf Hütte. This cabin is just above the city of Imst and there a cable car option to get down. Once in Imst, there’s good transport options, including train. I had already been to the Stuttgarter Hütte on the way from Oberstdorf to St. Anton and after Muttekopf I would only miss one last section. I considered this a reasonable compromise. I now had a total of 5 days for this. Obviously this was a little on the rough side and ambitious, but totally doable. I did drop the Augsburger Höhenweg from my plan at this point, though, since it would have added an extra day to my already tight plan. Stuttgarter Hütte – the Lechtal Höhenweg begins here. Also frequented by day trippers from Lech. I was tired after the walk from Oberstdorf to St. Anton. We’d walked long days and clearly I had not trained properly for the trip. I looked forward to a good night’s rest. I got a room at Anthony’s Life & Style Hotel in downtown St. Anton – very nice hotel, by the way, and I thought very reasonably priced in the summer for the quality. During skiing season this would probably be very expensive. I ate well, had a few beers and slept like a baby. I woke up to thunder and rain. Not good and to make it worse, I woke up feeling exhausted and tired. Almost feverish, in fact. I suppose this was one of those painful moments when your face gets slapped by the fact that you’re no longer young. After breakfast and looking at the weather forecast I made a tough choice: I’d stay in town and just relax. Being accountable to only myself and feeling out of steam why not? Optimistically, I figured I’d make up for the lost time on the mountain walking a couple of longer days. I got a visitor card from the hotel (for free!) that allowed free access to all the cable cars in St. Anton and a free round on the St. Anton golf course. Being an enthusiastic golfer, as soon as there was a break in the rain, I naturally used the golf option and played through the 9-hole course. A nice distraction. After golf, I took cable cars all the way up to Valluga, to which we had scrambled the day before. Looking at the construction site we had dealt with the day before made me feel happy we had not had any real problems. They could have been serious ones. Valluga, by the way, is a 2809m (9216ft.) 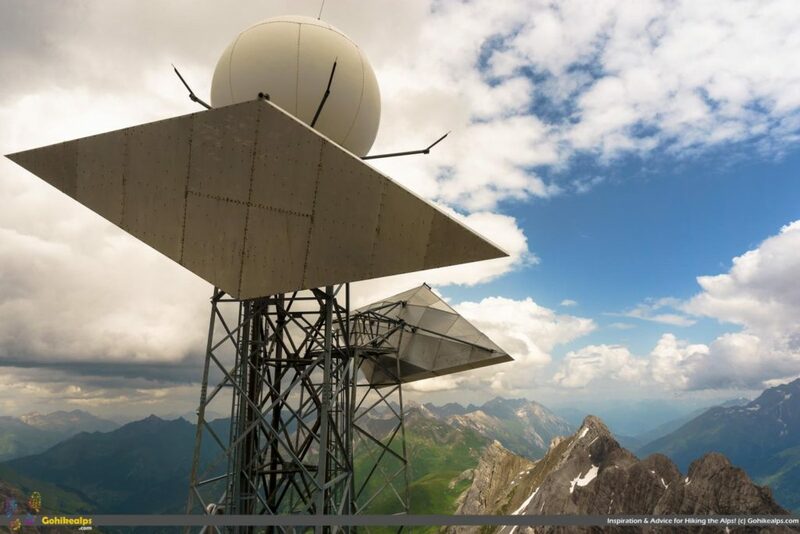 peak right on the border of Tyrol and Vorarlberg. It’s easily accessible by cable car from St. Anton. I took some photos and looked east towards the Lechtaler Alps, studying my route to come with a bunch of tourists. Then the rain & thunder continued hard. I was glad I wasn’t on the trail that day. Back down in St. Anton, I got all my gear in order, ate, relaxed more and prepared for leaving early the next day, no matter what the weather would be like. It was a completely different wake up from the day before. I was enthusiastic, full of energy and ready to go! The weather looked better, too! I didn’t regret taking the day off. 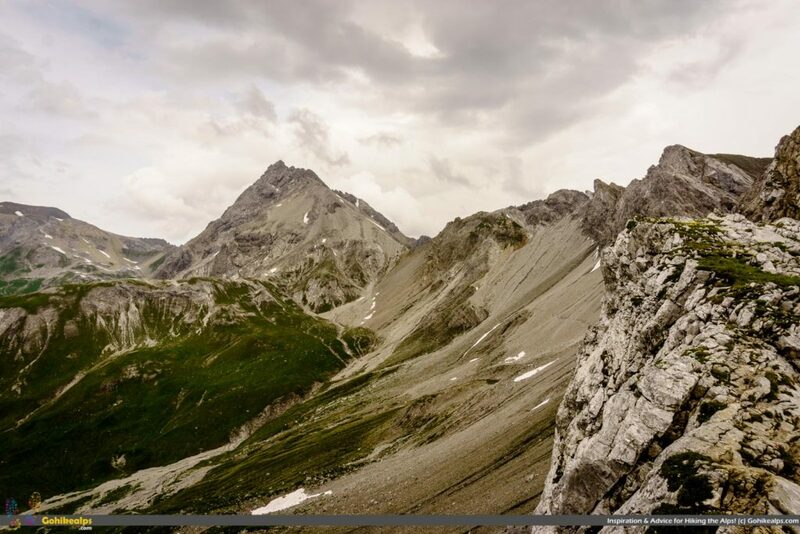 For my first day I planned to walk all the way to the Ansbacher Hütte – that’s almost three day-stages in one day totaling roughly 8½ hours and all rated difficult. To save my strength and plenty of time I chose to take cable cars up to the mountain. First Gampenbahn up from the town and then Kapallbahn to get close to the trail. If you’re starting in St. Anton, I recommend doing this since it saves you a couple of hours of walking up a ski slope. By the way: These lifts don’t run every day, so make sure you check! You can find lift information from the St. Anton am Arlberg website. Just off the Kapallbahn, the Lechtaler Höhenweg runs on the left hand side. Ansbacher Hütte is at the very end, above the valley. Too far to see. I was the first one up. Nobody to be seen on the mountain! It was chilly and cloudy but it was clearing up. The path was easily found and easy to follow. The walk to Leutkircher Hütte was uneventful. Leutkircher Hütte is easy to reach in about 2 hours and you can descend a different route back down to St. Anton from there. This makes it a popular day hike destination but this early in the morning, apart from several marmots, I met nobody. 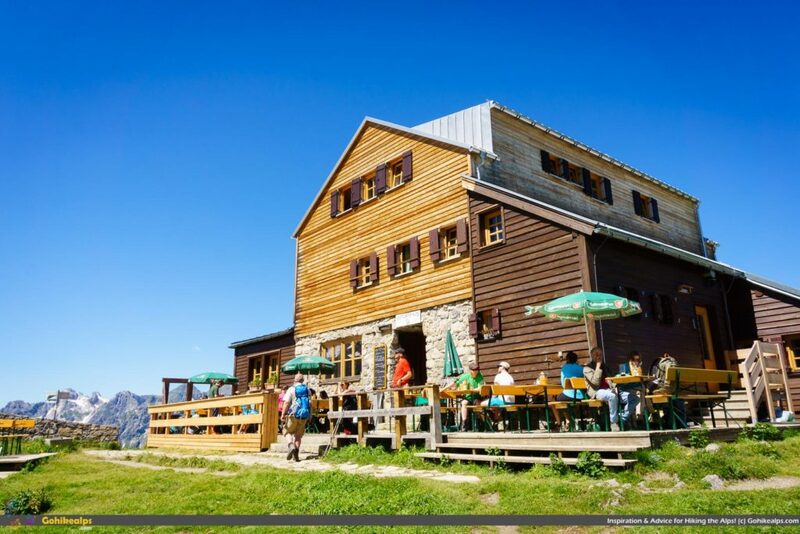 I spent a few moments at Leutkircher Hütte enjoying coffee and some refreshments. A very friendly atmosphere and very quiet with apparently very few guests. You can see the cabin from St. Anton if you know where to look and vice versa, so I imagine it might get quite a few day trippers for lunch. Continuing towards Kaiserjochhaus was again quite pleasant. With marmots keeping me company, I continued an easy section across grassy meadows. If you have some extra time and want to add excitement to this stage, you could go up the Stanskogel at 2757m (9045 ft.). I had a long day anyway so I skipped it. The trail got more demanding the closer I got to Kaiserjochhaus. There were some cabled sections and places where you just can’t have vertigo. I think this deserves the difficult rating. At Kaiserjochhaus it was time for lunch. I had a great Tiroler Gröstl and lots of sparkling water. Having walked for about 4 hours this refreshing break was just what I needed. Even though Kaiserjochhaus was wonderful, I didn’t even consider staying at for the night. Feeling great, I just pushed on! Towards Kaiserjochhaus amongst marmots – creatures that are amazingly quick to hide in front of a camera. 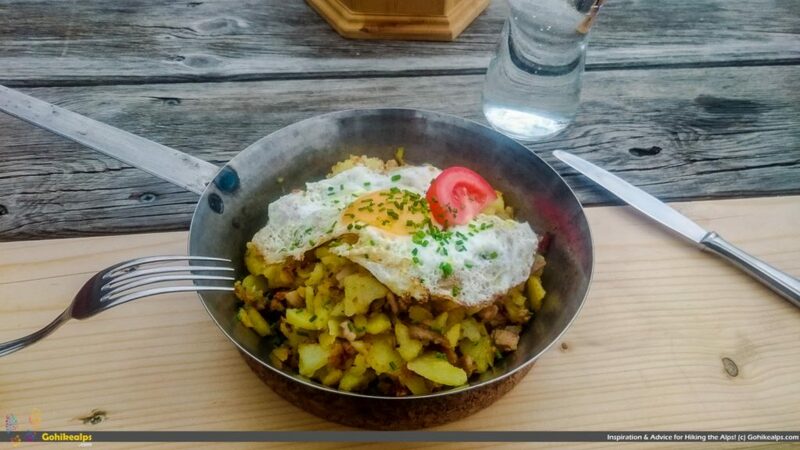 Tiroler Gröstl – Food of the Champions. Served at Kaiserjochhaus. The trail between Kaiserjochhaus and Ansbacher Hütte is much more demanding than the two stages before it. You can anticipate this already looking at the map, this being marked as a narrow, steep footpath with an “Alpin” designation. The estimated walking time is 4½ hours so it’s longer by itself than the two stages before it. Right after Kaiserjochhaus I crossed a large field of huge stone slabs and rubble, under the Grießkopf. 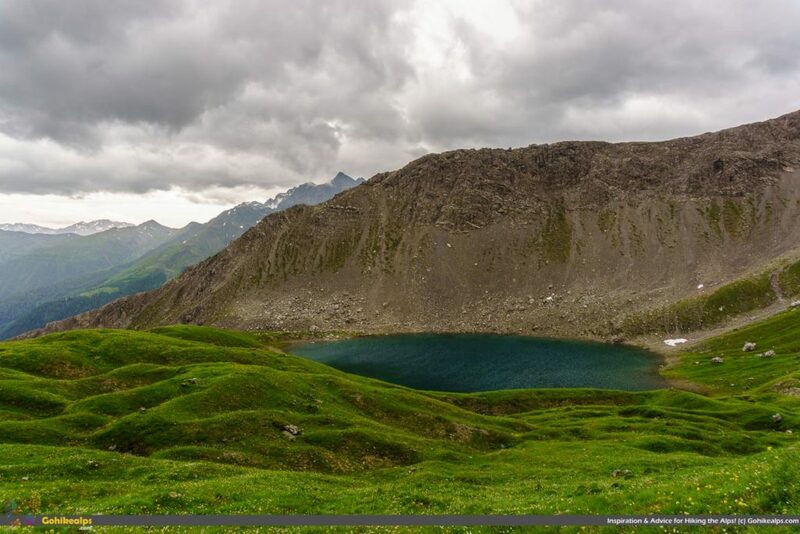 The trail then ascends to Krindlonscharte where you are awarded with beautiful views over Hintersee, a lone lake on the mountain. Then an easy traverse to Hinterseejoch. While climbing up towards Hinterseejoch, a thunderstorm started suddenly. It had gotten cloudier again so it wasn’t a big surprise but the timing for me was bad. I was almost on top and completely exposed. No shelter anywhere and a long way down. Not much else to do but wait it out. Thunder and lightning, of course, is not a good thing if you’re exposed on the mountain. You don’t want to attract lightning to yourself. I dropped my backpack and hiking poles to a spot where they wouldn’t roll down to the valley and walked further away to wait it out. Lechtaler Höhenweg leading to Hinterseejoch, which is right in the middle. Storm clouds gathering. Once the storm passed, I went back to get my gear and continued over Hinterseejoch to find Vordersee on the other side. That’s another beautiful lake with a little cabin on the shore. Somebody’s hide out, I’m sure. The path winds down close to the lake and then splits to the left (north) as Theodor-Haas-Weg. From there it goes through lots of gullies and ravines, and is secured by steel cables in many places. It was slow going. Eventually I made my way to Alperschonjoch where the going got easier. I was completely soaked and getting tired. The rain stopped but there was still some way to go. I took a break, ate some chocolate & nuts, drank plenty and tried to keep warm. There’s an option to go over Samspitze (2624m / 8609 ft.) and down to Ansbacher Hütte from there. In better weather and with a bit more energy I would have done that but now I decided to take the seemingly easier route around Samspitze and over Flarschjoch to reach Ansbacher Hütte. By the time I reached the Ansbacher Hütte it was late. I negotiated a bed in the dormitory and was lucky to not have somebidy right next to me. After a well-deserved, 1 minute hot shower and a change of clothes I was very ready to eat a hot meal. The restaurant was full and I was placed among a group of German gentlemen who were also doing the Lechtaler Höhenweg. Only one of them spoke good English and since my German is almost nonexistent it was a slow start. After food, several beers and wine we overcame language barriers and had a very fun evening! This would have been a very long day even without the rain and thunder. The gents I sat with had taken 3 days to reach Ansbacher Hütte and they had a hard time believing I had walked all the way from St. Anton. They were on a much more leisurely trip doing the suggested stages. Walking alone, I tend to prefer the trail over a crowded Hütte but that’s just me! I did like Ansbacher Hütte, though, and can happily recommend it for an overnight. In my next Lechtaler Höhenweg post I’ll describe my Day 2: Ansbacher Hütte to Memminger Hütte. Detailed contact info and all relevant details on Lechtaler Höhenweg in the Gohikealps Lechtaler Höhenweg Planning Guide. Make sure you’re fit. This is a difficult route. Make sure you’re equipped. Check what you need in the The Gohikealps Ultimate Packing Guide for the Alps. Thanks for reading! If you found this article helpful, please share using the share buttons on the left or below! Was This Useful to You? If yes, please share this to somebody who might also benefit from it! If you're planning to hike in the Alps, please sign up for Gohikealps Inspiration & Advice now and get our exclusive One Page Printable Gear Checklist - designed specifically for the Alps! It's guaranteed to save you a headache when it's time to pack! NextMemminger Hütte on the Lechtaler Höhenweg!